Mineola, New York : Ixia Press, 2017. In 1984, feminist poet Lorde learned that her breast cancer had metastasized to the liver. The moving title section comprises a series of journal excerpts that both frighten and inspire: choosing not to have a biopsy, she instead treats the disease with a stay at the homeopathic Lukas Klinik in Switzerland, consultations with more traditional medical specialists and alternatives like self-hypnosis. 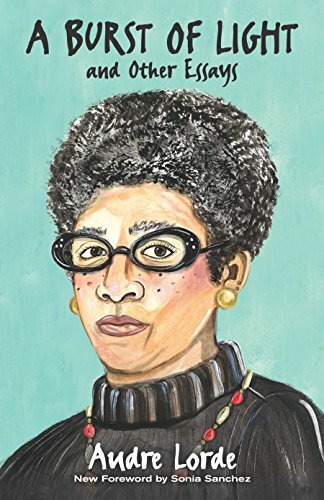 Her lifelong battle against racism, sexism and homophobia has armed her with the resilience to resist cancer, and thus ""A Burst of Light'' becomes not only a chronicle of Lorde's fight against disease, but a view of one woman's sparring with injustice, whether the oppressors are the South African police, the American government or malignant cells within her own body. Although it rings out with passion, anger and hope, the lengthy title piece is sometimes rambling and repetitive. In refreshing contrast, three outstanding essays on black lesbianism, the parallels between South Africa and the United States, and lesbian parenting are politically specific and pithy.